Hello my fellow StudioMagic compositors! I’m honored to once again have Harry Kerker, President of LayerCake/StudioMagic with us today. He’s going to be sharing two exciting ways to help put the impossible at your fingertips. Your imagination will run wild with what he’s about to show you so hang on! Here’s Harry. Prior to the advent of Photoshop, the image you captured through the lens was what you got. And if there was a subject involved, it required a lot of setup and prep to get both the subject and the environment to work in the same capture. I remember as a young art director working with the famous Reid Miles in Hollywood. Reid made a living on recreating Norman Rockwell in photographs. His technique was to shoot his subjects individually, take the Polaroids and make elaborated collages pasted together. Then he’d send them out to a retoucher who would make the prints and assemble them. The result was great, but it was time consuming and very costly to convince a client to spend the money on. Today Reid would be a Photoshop and StudioMagic advocate. All the things he so painstakingly created, can now be done on your desktop with StudioMagic. 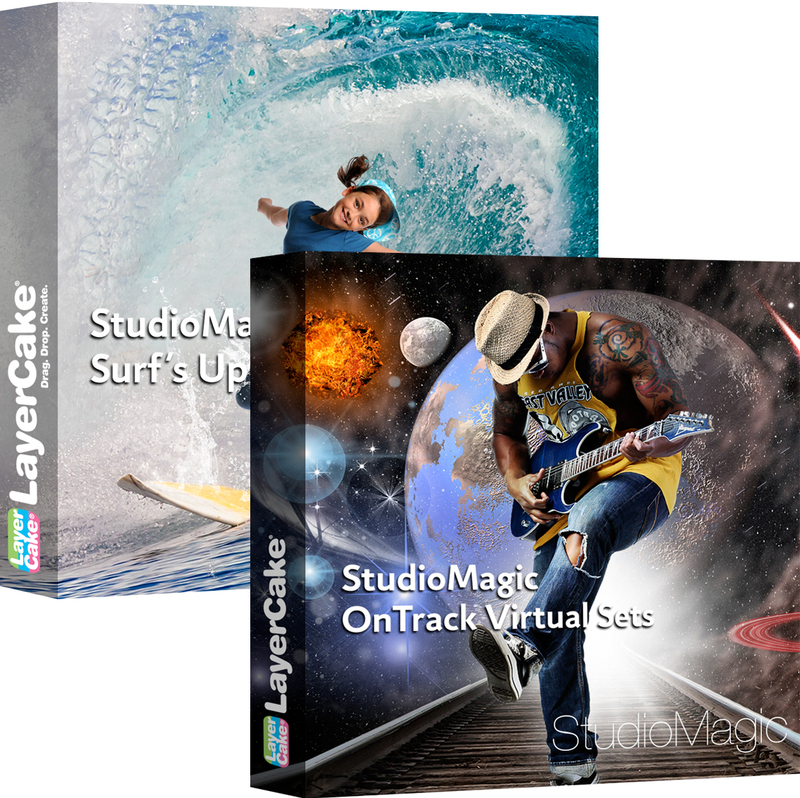 I’ll be using a few examples of our virtual studios, Surf’s Up and On Track. Neither of these could have been created without the use of Photoshop and StudioMagic for obvious reasons. I challenge you to think outside the box from now on just like Reid did. With StudioMagic you are no longer a prisoner of your studio, your only limitation is you imagination. All good composites begin with a good cut out subject. In this example the young lady is photographed in a studio against a neutral gray background. Now a studio is great, but not necessary, a wall in your garage could suffice. The point is the simpler the background the easier it is to separate your subject from the background. You want to have a good clean delineating edge between her and the backdrop for the masking tool to read. No worry about the flying hair, the StudioMagic CutOut tool has no problem with that. StudioMagic’s CutOut tool will work with more complicated backgrounds, but if you’re starting form scratch, why not make it easy on yourself. It’s clear in this next example that simplifying the background make the background selection process a lot easier. The StudioMagic CutOut panel has been pulled up and we’ve selected “Detailed CutOut” to pick up the flying hair and a ProMask incase we want to do some touchup work on the final cut out. You’ll notice that I have “Detect Outside Edge” selected as well, because in this case, we’ve selected the background and not the subject. I prefer seeing the red background under “View” in the refine edge panel. 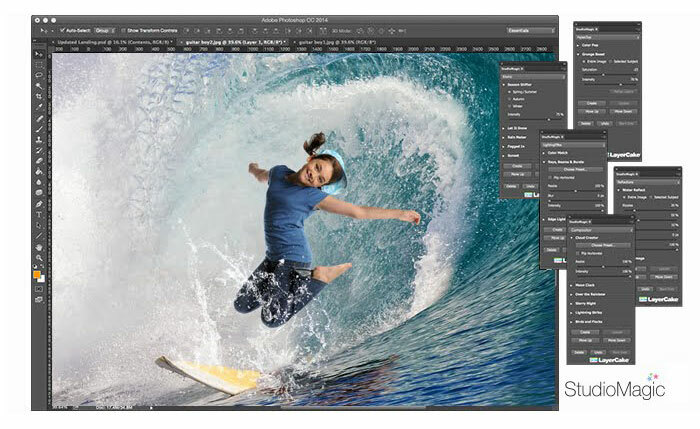 Once you are happy with you selection hit ok and your surfer girl is cutout and placed on a gray background ready to move into your Surfs Up virtual studio. The question always arises, “Why do I need this I already have refine edge in Photoshop? The reason being that refine edge is complicated and difficult to master. So we went to a panel of industry experts who determined the best possible defaults for compositing and we built them into the CutOut tool so all you have to do is click a button for great results. The next step is getting your subject into the virtual studio. You can do this a couple of ways, first a simple selection of your cutout subject then copy and paste into the virtual studio. Another way is to place you subject and your virtual studio side-by-side on your monitor and drag the subject from one image into the other. Is a Surf’s Up Virtual Studio in its default stage. We’ve copied in our surfer girl, rotated her correctly and sized her according to the size of the surfboard. This is a logical guess based on knowing how wide a surfboard generally is and the size of her feet. Shadows are highly underrated, without a shadow the girl looks pasted in. StudioMagic’s ShadowCaster makes perfect shadows that can be adjusted to the direction of the light. In this case the light is hitting her front on at a slight angle over her shoulder, the shadow is adjusted to match the direction of the light. Now she’s anchored to the surfboard. The final touch is the ocean spray that is provided as an extra in all the Surfs Up studios. Move the spray over her body and feet and it holds the entire image together. Now keep in mind, these types of images are supposed to be in fun and they have an illustrative feel to them. They are great for high-school seniors, kids and people of all ages who love something different. Believe it or not, portraits on railroad tracks are extremely popular and dangerous as well. Here’s how you take the danger out of the process and get the same fun result. The process is the same, as with Surf’s Up so we won’t go into the detail. Select your subject with the magic wand; you’ll see the dancing ants around it. Select “Detailed Cutout” and refine edge appears. Go in and out of refine edge by simply canceling it, which allows you to repair areas in the selection that you may have missed. Once ready hit “Detailed CutOut” again in order to see refine edge. Keep doing this until the subject is selected as well as possible. The red overlay will show you what’s missing and what needs to be added to you selection. The selection tool changes from add to subtract with the option key on the mac and the alt key on the PC. Final step, copy in your CutOut subject, add a shadow with ShadowCaster and you have a super portrait in minutes that without StudioMagic would have taken you hours and perhaps gotten you arrested for trespassing on railroad property! 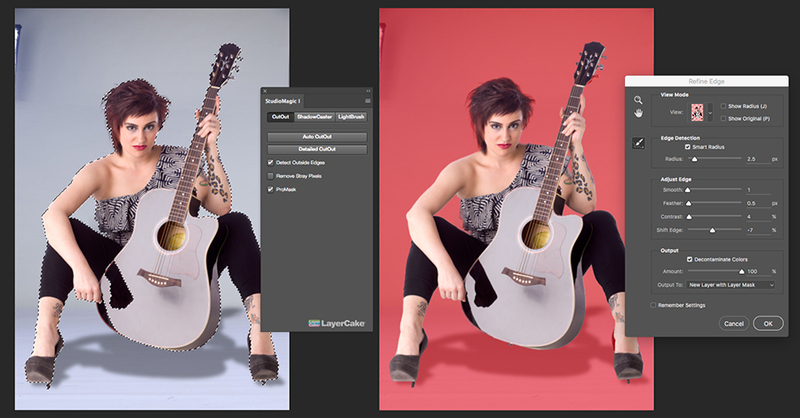 StudioMagic simplifies many of Photoshop’s most difficult tasks and reduces them to a few mouse clicks. It’s used by professional and novice Photoshop users around the world. It’s not necessary to own our virtual studios, you can make your own with StudioMagic. They just provide a nice starting place and an easy way to learn compositing without starting from scratch. StudioMagic was rated five stars by Photoshop user magazine the bible of the industry. So there you have it. StudioMagic with Surf’s Up and OnTrack virtual studios. Tons of different scenes in this package and a bunch of new ways to make some cool composites. Get creative and happy compositing! See tutorial for OnTrack Click Here! See tutorials for Surfs Up Click Here!